Here's a nice piece of topology. Notice that no two rings are linked, yet all 3 rings are linked. 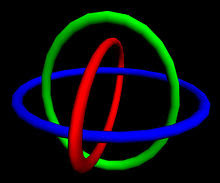 You could use this a a model for the proton - the rings representing the 3 quarks that make up a proton and "ring linkage" representing the color force. Then we see that the color force is very unusual. It's a 3-force, meaning it only appears when you have 3 objects, the force between any 2 objects being zero. This model even shows the famous "asymptotic freedom" and "confinement" of bound quarks. When the rings are very close together you can move them around as if they were free (asymptotic freedom), but when you try to pull them apart a strong force appears to stop you (confinement).